Bad news, Miami. Of all Florida's major population centers, the city is the most vulnerable to strong hurricane winds, according to Florida State University researchers who developed a new tool to estimate the frequency of extreme hurricane winds at a particular location. 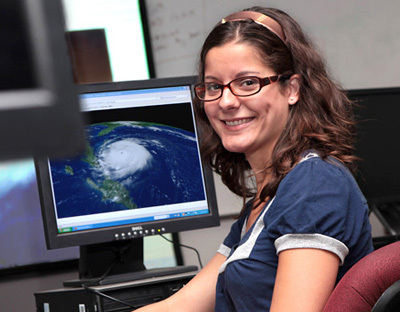 Geography doctoral student Jill C. Malmstadt, working with Professor James B. Elsner and research consultant Thomas H. Jagger, created the Hurricane Risk Calculator and used it to estimate the risk to 12 cities in Florida. The findings are outlined in "Risk of Strong Hurricane Winds to Florida Cities," to be published in the November issue of the American Meteorological Society's Journal of Applied Meteorology and Climatology. "Not unexpectedly, we found that the extreme wind risk from hurricanes varies across the state," Malmstadt said. "Areas in the northeast, such as Jacksonville and in the Big Bend between Tampa and Tallahassee, have longer periods between occurrences of a given strong wind speed compared to areas such as Miami and Pensacola. That's also where we found the highest annual threats of a catastrophic hurricane event." Using the Hurricane Risk Calculator, the researchers found that Miami can expect to see winds of 112 mph or stronger — that's a category 3 hurricane — once every 12 years on average. Miami last saw winds of that strength with Hurricane Wilma in 2005. By contrast, Tallahassee, the state's least vulnerable city, can expect to see winds of that speed only once every 500 years. The Hurricane Risk Calculator is a statistical model based on extreme value theory — a theory that is used to estimate the occurrence of the rare and extreme events like hurricanes Andrew and Katrina, Malmstadt said. Researchers applied the theory to wind speed data derived from the National Hurricane Center's Hurricane Database, which is the official record of tropical cyclones for the Atlantic Ocean, Gulf of Mexico and Caribbean Sea dating back to 1851. "This method is unique because it uses extreme value distributions that allow us to better estimate extreme events," Malmstadt said. "Other approaches use various distributions that work incredibly well when trying to estimate the average event, like category 1 or 2 hurricanes. They may be underestimating or overestimating the extremes even if they are right on with the average." The Hurricane Risk Calculator can provide important information to emergency planners, the insurance industry and homeowners, Malmstadt said, noting that the state of Florida especially has experienced more than $450 billion in damages from hurricanes since the early 20th century. "Hurricanes top the list of the most destructive and costly natural disasters in the United States," she said. "For society to better cope with and mitigate these disasters, a more precise estimate of the risk of high winds on the local level is needed. The Hurricane Risk Calculator does that." Florida is particularly vulnerable to hurricanes because warm seas surround the state, but some locations are even more vulnerable than others. Along with Miami, its South Florida neighbors Port St. Lucie, Key West and Cape Coral are the cities with the highest wind strength and shortest return periods. Gulf Coast cities Pensacola and Panama City are no strangers to strong hurricane winds, although their locations in the western Panhandle mean they are protected somewhat by the Florida peninsula itself from winds coming from the southeast. Still, Pensacola can expect to see a hurricane with 112 mph winds once every 24 years, according to Malmstadt. The cities of Orlando, Tampa and Jacksonville join Tallahassee as the cities with the least vulnerability. Still, Malmstadt cautioned that "people who live anywhere in Florida could receive a hurricane threat, so they should always be ready and prepared for one of the extremes." The researchers also used the data that went into the Hurricane Risk Calculator to determine whether the wind risk from hurricanes is changing over time. Although they found that the frequency of hurricanes and major hurricanes is constant throughout time, there is an upward trend in the intensity of the strongest hurricanes in Florida. Intensification refers to the amount of increase in maximum wind speeds between hourly observations of a given hurricane. "The strongest hurricanes appear to be getting stronger," Malmstadt said. "This is consistent with the increasing ocean heat content noted over the Gulf of Mexico and the western Caribbean." However, the greater intensification rates do not necessarily mean that hurricanes are more intense at the point of landfall, she said, adding that additional study is needed to make that determination. The National Science Foundation, the Risk Prediction Initiative of the Bermuda Institute for Ocean Studies and the Florida Catastrophic Storm Risk Management Center provided support for this study. "The strongest hurricanes appear to be getting stronger. This is consistent with the increasing ocean heat content noted over the Gulf of Mexico and the western Caribbean."